Several UK military aircraft were badly damaged in a "freak" hailstorm in Afghanistan, leaving the Ministry of Defence with a £12.6m repair bill. Seven fixed wing aircraft and five helicopters were damaged in the storm in Kandahar on 23 April 2013. One was damaged beyond repair. The damage came to light following a freedom of information request by IHS Jane's Defence Weekly. An MoD spokesman said it was a "freak storm which could not be predicted". He added: "Although some aircraft are kept under shelter, operational requirements mean that a number of aircraft will be out in the open at any time." The damaged aircraft were five Hercules C130J, one BAE 125, one BAE 146, three Chinooks, one Lynx Mk9a and one Sea King Mk4. All the aircraft have now been returned to service with the exception of the BAE 125, which could not be repaired. The Sea King has subsequently been retired from service. According to Jane's Defence Weekly, aircraft damage levels are classed in several categories - Category 1 is regarded as the aircraft being repairable within first-line capabilities, with Category 5 being the aircraft considered beyond economic repair. The five Hercules transport aircraft sustained Category 3 and 4 damage, which cost £9.1m to repair, Jane's said. The BAE 125, and BAE 146 aircraft suffered Category 3 and Category 4 damage respectively, costing £1.73m to fix. The three Chinooks, the Lynx and the Sea King received £386,500 in damage. An RAF source said: 'We knew there was a storm coming, but the forecast wasn't anything like as bad as it turned out to be. "Tornados and Reapers were under cover, but you can't put everything in a hangar at Kandahar, because there are not enough available. 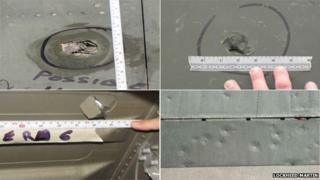 Sadly some aircraft were badly damaged." How many foreign troops are in Afghanistan?